The bbpress edit profile section should look a little better on smaller device widths. The labels should be on top of the input boxes , right now they are just inline with the input boxes. When they are inline on smaller device width they look all awkward because the words break up. #2711.patch​ (1.4 KB) - added by Robkk 4 years ago. 2711.patch​ (1.5 KB) - added by Robkk 4 years ago. 2711-2.patch​ (1.8 KB) - added by Robkk 4 years ago. 2711-2.patch adds basic styling to the edit user profile page's inputs, labels, and descriptions to make them full width. The patch also add 20px padding above the #bbp-user-body to have space for the #bbp-user-wrapper. 2711.3.patch​ (1.4 KB) - added by johnjamesjacoby 2 years ago. Of note, initially you can get by without worrying about Grunt and NodeJS to create a patch but further down the road these will be important parts of the arsenal to test patches for bbPress, I'm currently working on adding instructions for this to the WordPress Core Handbook which will then be added to bbPress. alright i already have git for windows installed , and i also have tortoise SVN installed too. Our GitHub mirror repo is not setup at this stage, soon, just not yet. then just follow the rest of the tutorial on creating patches. Am i following it right?? 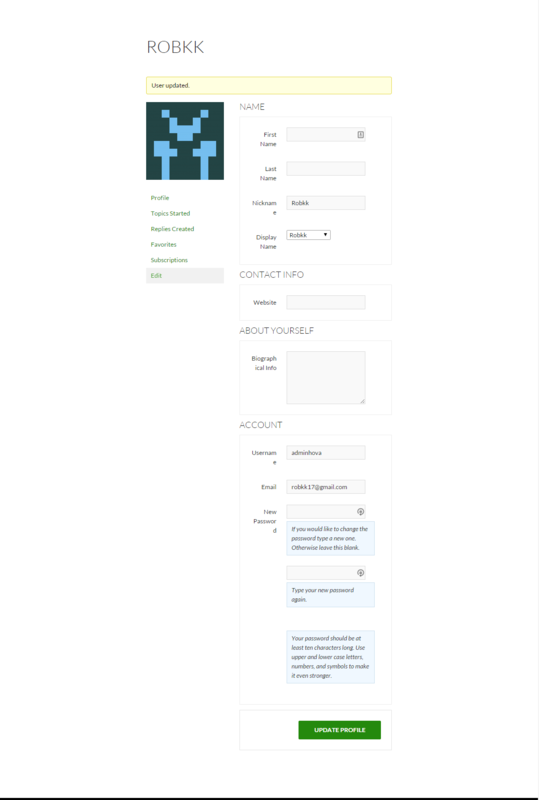 @netweb I think I got it right this time, maybe one extra line of whitespace on accident but i think the headers are fine now. This looks good and definitely works for mobile. I'd put in a bit more space after the #bbp-single-user-details div but that's about it. This actually works much better and looks just as good across all widths - the current design breaks rather quickly at just over 1250px browser width in twentyfifteen and starts out broken in twentyfourteen. What do you think about making it the default rather than in an @media rule? @robkk? Also, I would make the span.description for the password fields the same effective width as those inputs. It'll just require switching to %s for padding. 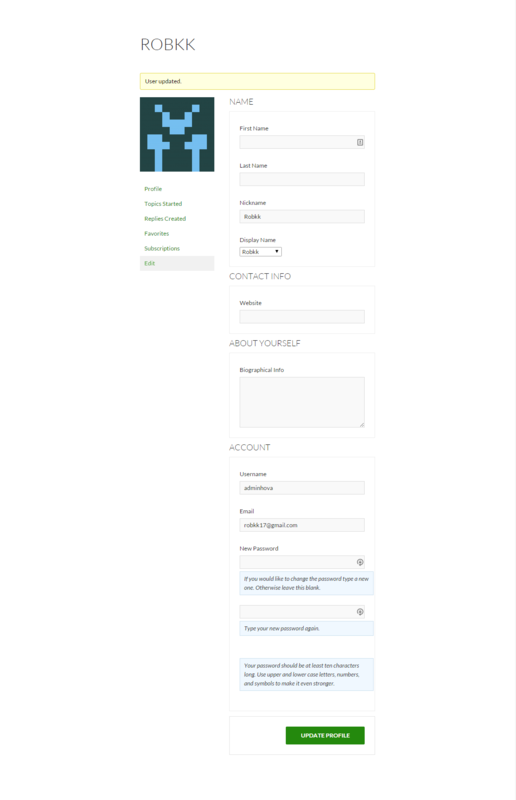 I wouldn't mind it being default , i will add another patch for it later with the modified span.description CSS. Thanks @Robkk, these look great, I'm still unsure about 480px and above being block rather than inline, I will have a look in a couple of other themes. I can make it where its all below 480px, its no problem.